I understand that the 32 bit OS does not support 4 GB of RAM. Can you run a 1GB & 2 GB sticks of memory in the Y510? What are the ramifications of running this combination. Does one module slow down the other? Etc. but with small utility I can overclock it a bit to reach 5. Which utility are you referring to? Details, please. Yes, sure you can use 2x2gb modules in dual channel. Even 2x4gb, 2x8gb or 2x128gb of memory modules if you find them, but 32bit OS can oly handle 4 gb of memory and Microsoft Vista 32bit and XP 32bit due to memory adresses for devices allocation can handle 3.25 gb of memory in unusual situation (tons of efforts) and 3 gb in usual situation. So, you just insert 4 or 8 gb of ram and either upgrade your system to 64-bit OS or leave all amount of memory above 3 gb unused - for further use. All modules of RAM in the system will work on a maximum speed for the slowest module. For example: if you've got three ddr2-800 modules and one ddr2-400 module in the same system they all will be functioning on the ddr2-400 speed. The same si about their timings. you need to set the clock generator to ICS9LPR604AGLF for Y510. I did overclock it just to test the possibility. most of the time I use RMClock to step down CPU to 6.0x at 0.9625 Volt. I thought it won't operate in dual channel mode. 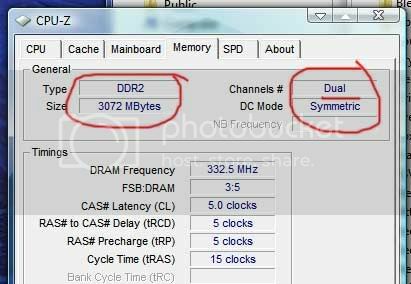 both modules are DDR2-5300 CL5-5-5-15. but i don't have stability problem. i believe there would be some hardware limitations that prevent us from using 4gb (or more) ram modules. As far as I know the dual channel mode is only available with two modules of the same capacity. About 4 gb modules - I don't think there will be hardware limitations and blocks for such modules. Good tips. Thanks for the links and names. Did you check the Vista Experience number while on a different power setting? Does anyone know if this makes a difference? Here's why I want 3Gb and hope that it helps. I multitask quite a bit, so I'll have 15 internet browser tabs open sometimes when doing research. I find that eventually, general functions like clicking icons and opening and closing windows just stop working. This was worse in XP and I've gotten Vista to do it as well. Do you guys think that more RAM will help this? I just can't see webpages overwhelming the page file size. and it automatically set to high performance mode before starting the test. never have a slow down or none responsive system even in a 1 gb system. so 2 gb for web surfing should be fine. keep ie for only some stupid pages that require it. it could be other program running behind that take a lot of system resources, like anti virus/ spyware.